Facer, a popular Android Wear app that lets you create your own watch faces, has today been updated (via Phandroid) to support the official watch face API part of the newly-released 5.0 update to Google’s wearable OS. The new API, which this update takes advantage of, allows faces to act more like a native watch face and less like a hack, which is going to make them just a bit more functional, efficient, and easier to manage. While the addition of support for the watch face API should make watch faces created with Facer more powerful and much more battery efficient, the Android side of this app has also been updated today, bringing Material Design. 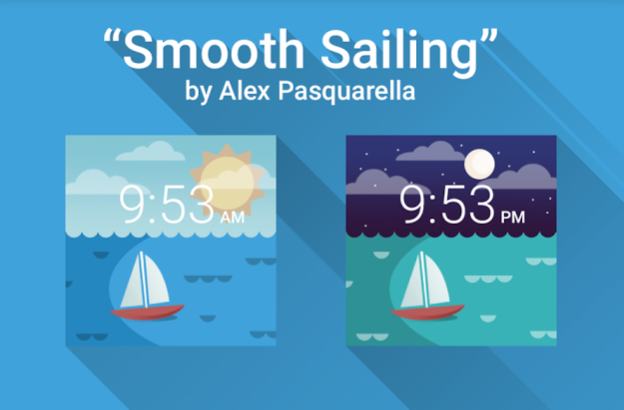 Additionally, the app comes with a newly created watch face called “Smooth Sailing,” which gives users a look at what’s possible with today’s update, including super fluid animations that can change depending on the time of day. Enjoy an all new, free watchface! Facer has been updated with an all new, and beautiful, Material Design. Facer now incorporates colors from the watchfaces to make them look stunning! The update also includes support for the WatchFace API, allowing Facer to be more powerful, while using far less battery. The all-new math system also allows you to create super fluid animations, just check out “Smooth Sailing” for a peek at what’s possible! You can grab the latest version of Facer for $1.00 on the Google Play Store, but there’s one catch: you’re going to need the latest version of Android Wear, version 5.0, to take advantage of any of today’s new features. As you may know, the latest version of Wear should be rolling out to devices as we speak.